Author: Grafton, Sue Set In . . . Through fourteen books, fans have been fed short rations when it comes to Kinsey Millhone's past: a morsel here, a dollop there. We know of the aunt who raised her, the second husband who left her, the long-lost family up the California coast. But husband number one remained a blip on the screen until now. The call comes on a Monday morning from a guy who scavenges defaulted storage units at auction. Last week he bought a stack. They had stuff in them--Kinsey stuff. For thirty bucks, he'll sell her the lot. Kinsey's never been one for personal possessions, but curiosity wins out and she hands over a twenty (she may be curious but she loves a bargain). What she finds amid childhood memorabilia is an old undelivered letter. It will force her to reexamine her beliefs about the breakup of that first marriage, about the honor of that first husband, about an old unsolved murder. It will put her life in the gravest peril. 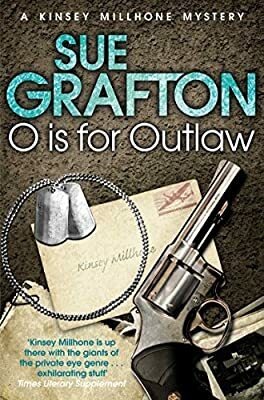 "O" Is for Outlaw: Kinsey's fifteenth adventure into the dark side of human nature.